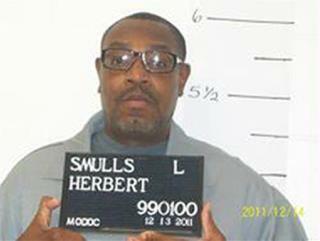 (Newser) – The US Supreme Court is expected to rule today on two petitions regarding Missouri death row inmate Herbert Smulls, the Missouri Attorney General's office says. Smulls' execution was temporarily stayed late yesterday with an order from the high court signed by Justice Samuel Alito. It was sent about two-and-a-half hours before Smulls was scheduled to die at 12:01am today. Smulls' lawyer, Cheryl Pilate, made last-minute pleas yesterday to spare his life, focusing on the state's refusal to disclose the name of the compounding pharmacy that produces the lethal-injection drug, pentobarbital, for use in the execution. Pilate contends that the state's secrecy makes it impossible to know whether the drug could cause pain and suffering during the execution process. Alito is a "conservative" Justice?! It shows how left-wing the high court is. Murderers should be executed. Our Constitution even mentions explicity the death penalty. The makers of the Constitution did not consider it to be cruel or inhuman punishment. The Bill of Rights guarantees a speedy trial. Yet, the courts obstruct the verdicts of the people and the juries. The trials should be speedy, and the executions performed as in the past, in public. Now they can be televised. We could reduce the prison population, and restore faith in the judicial system if we executed in a short time those convicted of murder. Don't sweat Herb, they will find a way to kill you. What a sick society. All it concerns itself is with the pain and suffering that this scumbag POS might experience. Nothing is mentioned about the heinous nature of his crime, how horribly he made others suffer, and JUSTICE!!!!!!! Stop wasting time and pump a few well placed bullets between the eyes - let him see what's coming.